Directed by Jeff Nichols, “Take Shelter” is yet another existential drama where dreams and reality mesh on a year where many films seemed particularly interested on this subject. The movie is anchored by the great performance of Michael Shannon playing Curtis, husband to Samantha (Jessica Chastain) and father of a little girl who was born deaf. The film is about his struggle to maintain the seemingly perfect life he leads while dealing with deeply upsetting dreams and visions that feel like premonitions, both to the audience and to his character. As the days pass, the dreams and hallucinations continue, getting more vivid and upsetting. He feels there is some sort of cataclysmic event coming and that he must do everything he can to protect his family from the disaster. No matter how certain he becomes about what he must do, there is a lingering hesitation that is rooted in his mentally ill mother, who has suffered from schizophrenia for decades. Crucially, Curtis tries to maintain the appearance of normalcy, afraid those around him will think he is crazy. Not surprinsingly, the facade quickly falls apart and he must choose whether to stick to his plan or further alienate himself from his family and friends. Despite the well crafted script, “Take Shelter” becomes more about discovering whether he is mentally ill or not, than about the story of Curtis. This is a flaw that mostly stems from the unoriginal theme rather than the film’s structure. It is, after all, delivered to audiences that are familiar with hallucinatory tales like “A Beautiful Mind” or movies like “The Sixth Sense” that have made us especially cynical, often prone to reducing a good film to its final twist. The film, though great in many ways, suffers from the constant and unnecessary suggestions that frame and prepare us for the final twist. We might not be exactly sure what the outcome will be, but the film reduces our interest to finding out what really happens in the end, taking our focus away from the nuances of the plot. The script could have also benefited from more substantial supporting characters. 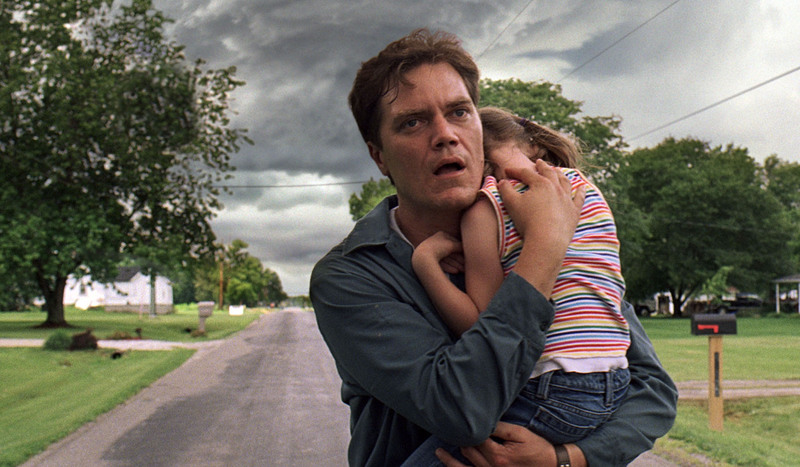 Take Shelter becomes too much about Michael Shannon’s own struggle when a good part of it was rooted in how he affected his family and his livelihood, yet we know little about them. Beyond its faults, “Take Shelter” is a well crafted film elevated by a very strong cast led by a wonderfully mysterious and troubled Michael Shannon who, once again, exceptionally delivers by playing a non-remarkable guy with very unique problems. This is yet another 2011 films I haven’t seen. Heard plenty of good reviews about it, including yours. Also interested to see more of Chastain. Nice review! I think it’s definitely worth a viewing. You might like it more than I did. Nice review, Niels. I liked this one a bit more than you, but I can understand your points. As far as movies about mental illnesses go, I thought this was one of the better ones, and the ending is something that I still can’t stop thinking about. It’s disappointing that Michael Shannon didn’t at least get an Oscar nomination for his performance. It’s one of the better ones for sure. I actually found it to be more entertaining than I thought it was going to be, but it let me down a bit conceptually. Michael Shannon should have definitely been in the running for the Academy Award, along M. Fassbender. I felt very similar to you about this film. I enjoyed it, but I didn’t LOVE it as I thought I would! It dragged in the middle, but the last act was pretty cool. Glad you agree. I thought it was pretty good too, enjoyable but simply not great. I expected a bit more. I loved this movie. It rated well in top 10 films of last year. I like that the ending leaves the movie open to decide your own outcome. (Is he insane or not). It is certainly worthy of a watch though. So far it ranks 13th in my 2011 list of best films of the year, so it was not as bad as it comes across in my review. I don’t really agree with you in terms of the outcome though. I actually feel it’s pretty clear that he’s not crazy and that his visions were indeed premonitions. You can see the cataclysmic storm approaching in the window’s reflection and his wife seems to understand that she should have stuck with her husband all the way through. Just wanted to say that I enjoy the layout of your site. Interesting and different – unique and full of quality writing. Thanks for the compliment. I’ll be checking your blog as soon as I’m done writing this. You bring up a valid point about the supporting characters, but I personally found that learning more about them would’ve taken away from what I was most interested in…Curtis. I just wanted to know what was going on with him and am glad the film focused on him and his family. The end was the best! Great review. Glad you liked this film. One of my faves of last year! Interesting review. Can’t say I disagree with anything you’ve said. Especially the supporting characters part of it. Jessica Chastain was good as the supportive wife, but there needed to be more. More from his friends. More from those around him. There was one point in the middle of the film where I did just want it to get to its, almost, inevitable end. Drawn out, but not in a very good way. Still, overall, a pretty solid film with a great central performance. Exactly. I found myself waiting for the final twist to come pretty early on, which made me lose interest in what was happening throughout. Still pretty decent though.